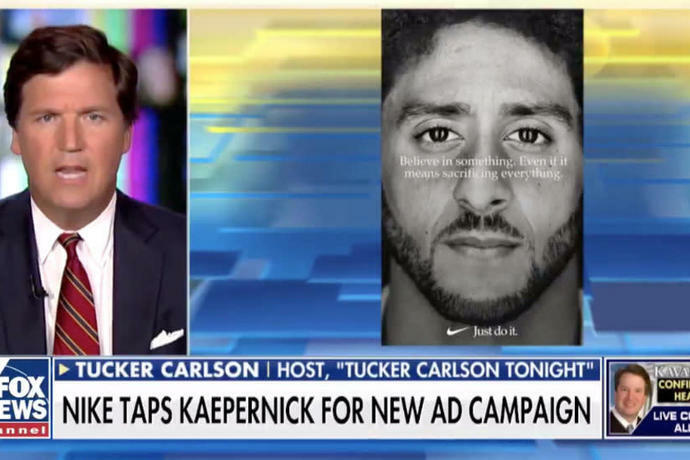 Fox News host Tucker Carlson slammed Colin Kaepernick and Nike executives on Tuesday, calling their collaboration on a controversial new ad "an attack on the country." Appearing on "Fox and Friends," Carlson took particular aim at the Nike officials for featuring Kaepernick in the spot for the 30th anniversary of the company's "Just do it" campaign. A picture of Kaepernik appears with the tagline: "Believe in something, even if it means sacrificing everything," referring to the price the pro football quarterback has paid for helping instigate protests by NFL players during the playing of the national anthem. Carlson said "there's something decadent" about the ad, insisting it shows that some of nation's "the most successful people" hate U.S. society. "And it's a metaphor for our entire ruling class, many of whom feel that way," he insisted. "They hate and resent the very system that made their prosperity, their success possible. He later characterized the ad in apocalyptic terms, saying Nike's "attack" on this country is how "everything falls apart." "Here you have a boardroom of corporate executives deciding that they are going to profit off of attacks on the country that made their company possible," Carlson said. "That is a really ominous thing." As for Kaepernik, he scoffed at the anthem protests that the player and a teammate started during a preseason game in 2016. "This is an attack on the country," Carlson said, arguing "it'd be very different if he were protesting this politician or this policy, or this specific policy for this specific thing." Instead, the conservative commentator said, "sitting during the national anthem is a way of making a broad-based, generalized, and therefore impossible to rebut, attack against the country that made him and Nike rich." Kaepernick and the players that have carried on his protests have stressed that their aim is to draw attention to systematic racism and police brutality, especially cases in which law officers have fatally shot unarmed blacks during traffic stops and other interactions. They also have stressed the protests are not intended to disrespect the flag or the U.S. military. Carlson, who hosts an 8 p.m. weekday show on Fox, was dismissive of the player protests, saying it's not like the issues they're spotlighting had "never been raised before." He also termed the ad's tagline "factually ludicrous" because of Kaepernick being on Nike's payroll. But Carlson ignored that the quarterback ― who led the San Francisco 49ers to a Super Bowl appearance in the 2012 season ― was cut from the team following the 2016 season and has not been picked up by any other team. 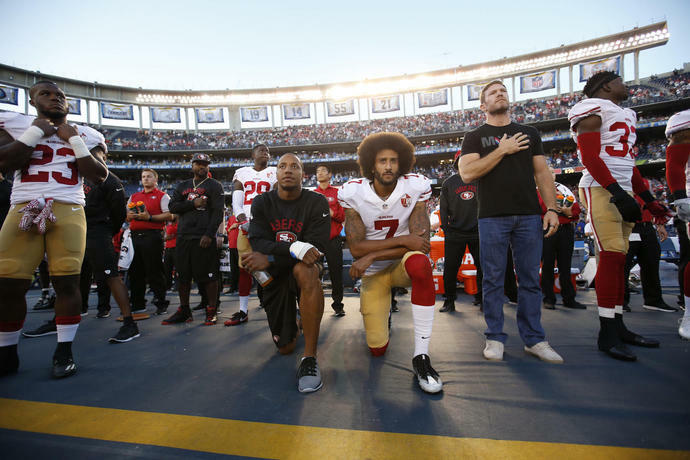 Kaepernick is pursuing a legal grievance against the NFL, alleging that he has been blackballed because of his political activism.